Please thank LEGADEL for all they have done for Eli. Both Sharon and myself are extremely grateful and would never have been able to deal with the challenge Eli has without your support. Jodi Kelly has been amazing and we are so grateful to have met her. Thank you very much to your organisation and your staff. 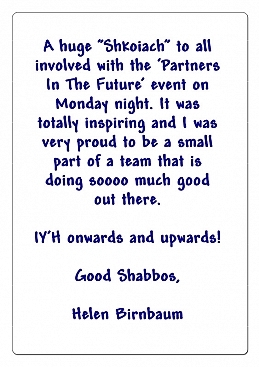 Yasher koach for the amazing work that you do for the children in the community! 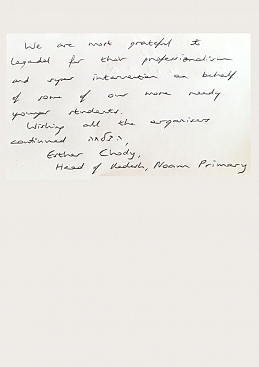 We personally are extremely indebted to the Legadel professionals, Faigy and Jodi who have been a lifeline for our family since we’ve met them a few years ago. May you go mechayel e-l chayel in the incredible job you are doing! I just wanted to say how much I enjoyed yesterday evening’s ‘Partners In The Future’ event, the speaker was incredible and I know his words will continue to be an inspiration to me and I’m sure many others for a long time to come. Thank you for giving me the opportunity to be part of this special organisation, it has brought a new meaningful dimension to my life that I deeply cherish. The discharge letters are excellent. It is clear that a lot of thought went into them and the process. I have no words to thank- you for the amazing transformation and excellent running of your organization. BH my son has done fantastically, thanks to your wonderful OT specialist and has been discharged. During our final meeting Britt mentioned that C would benefit from Physiotherapy. When Sharonie saw what a loss I was over how to go about finding someone, she kindly offered to ask the treasurers if they would be willing to provide this service. Only due to your kind generosity has this been made possible, and will enable C PG to achieve his best. 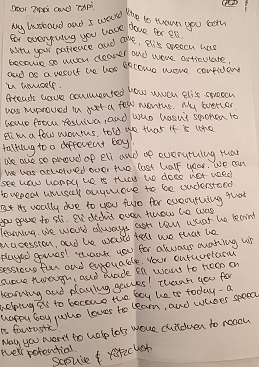 Thank-you Thank-you Thank-you for giving C the help he needs, letting us see the smile on his face as he succeeds and providing the ability to give sessions in school. Please pass on a huge thank you to the organisers of this event and the wonderful speaker. I thought that it was very informative and hugely helpful. I also thought there was a lovely atmosphere with Jewish women coming together for a common purpose. Thanks again and I wish you success in all legadel’s endeavours. The treasure chest is on a high safe shelf in the dining room. Thank you for all you've done until now, to help Nochum reach this far. I would like to express my deepest gratitude and appreciation for all the wonderful work and support that you provide my dear son. My son has been changed to a happy and confident child who enjoys now being part of the class. He loves to go out to legadels lessons. Thank you again I wouldn't have been able to do it without you. I would just like to wish you lots of sucsess in your wonderful work. 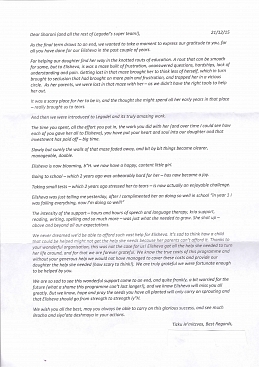 Thank you for the speech and language assessment report which was sent to me via the school SENCo. 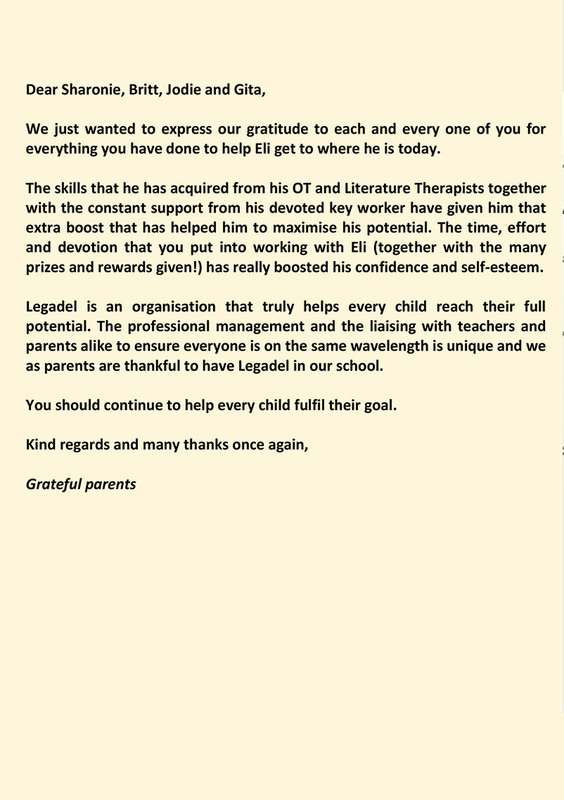 I just wanted to thank you and have you know that we are very grateful to Legadel for all the help that our son is receiving through your organisation. I cannot thank you enough for this incredible organisation and what you give to the families involved! 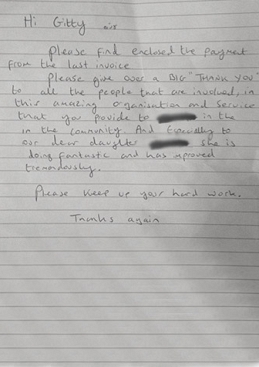 We just wanted to take this opportunity to thank you and everyone at Legadel for the phenomenal service you are providing both the wider community but specifically our family. What we refer to as ‘our journey’ began a decade ago, when our beautiful first born son was born. Whilst he was B’H healthy at birth, by the time he was three, we were noticing that he just wasn’t developing quite in the way that we expected. 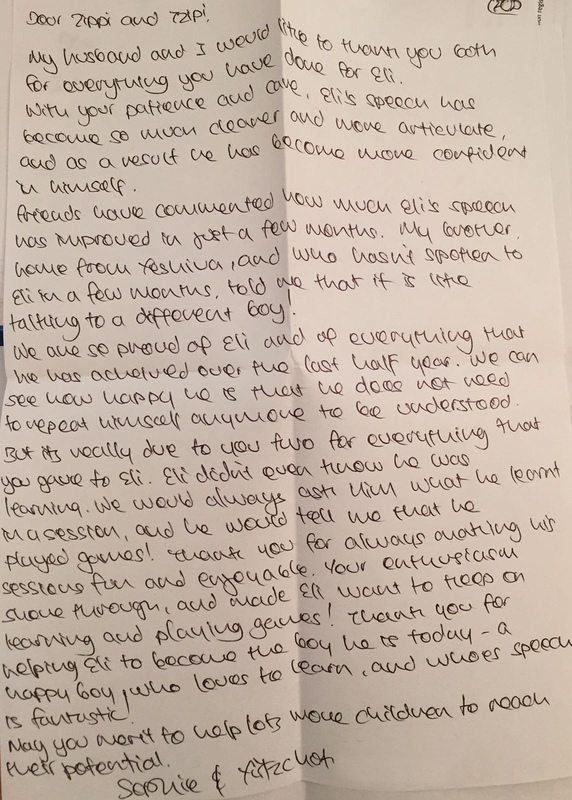 He spoke a little later than his peers, he went through periods of selective mutism and by the time he reached school age we realised that he just wasn’t progressing at the same rate as most of his class. We had him tested for Autism of course, but this was ruled out early on. He made friends at school and moved along with the rest of the class, but was always trailing behind. 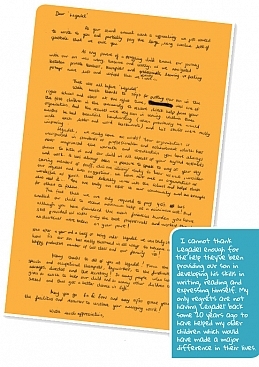 When he was 6 we finally decided that we must do something to see if there was any way in which he could be helped to reach what we as parents felt was his true potential. 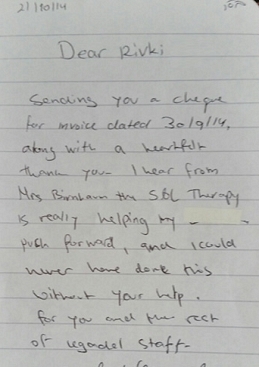 We had him assessed by an educational psychologist who suggested that both Speech Therapy and Occupational Therapy might help him. At this point, some 4 years ago we hadn’t heard of Legadel and our son’s school was not yet involved. 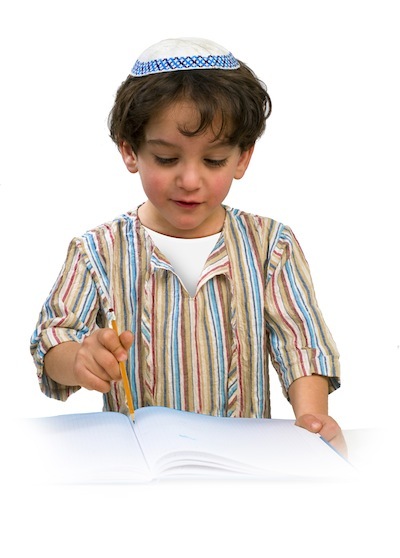 We began the process of OT for our son at what for us what an astronomical cost of £100 a week. 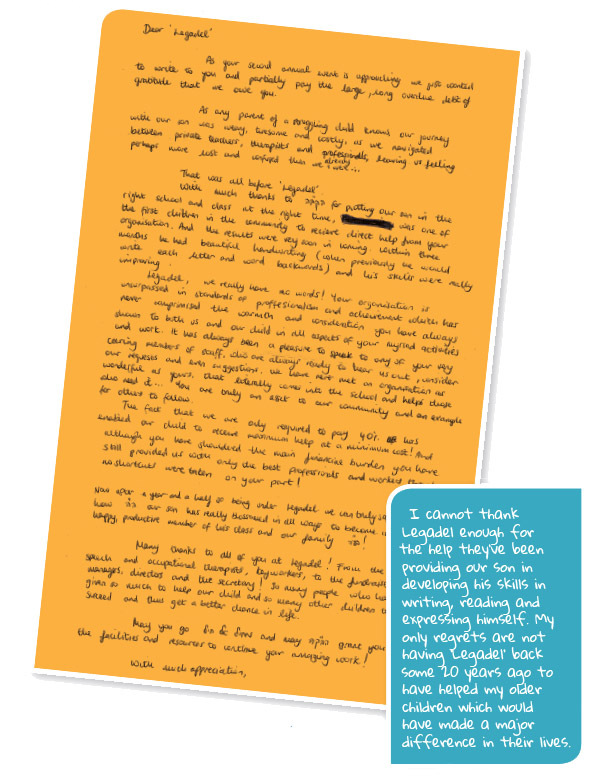 It helped him and despite the strain that it put on our finances we persevered. 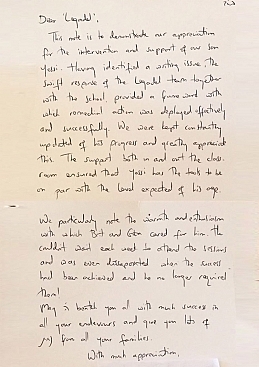 Not long after this, our second son, a twin born at 31 weeks had reached Reception age, and because we had no early indication of potential issues for him (he reached his milestones on time), we were both shocked and rather devastated to find that he too appeared to have severe educational needs (as well as medical needs). 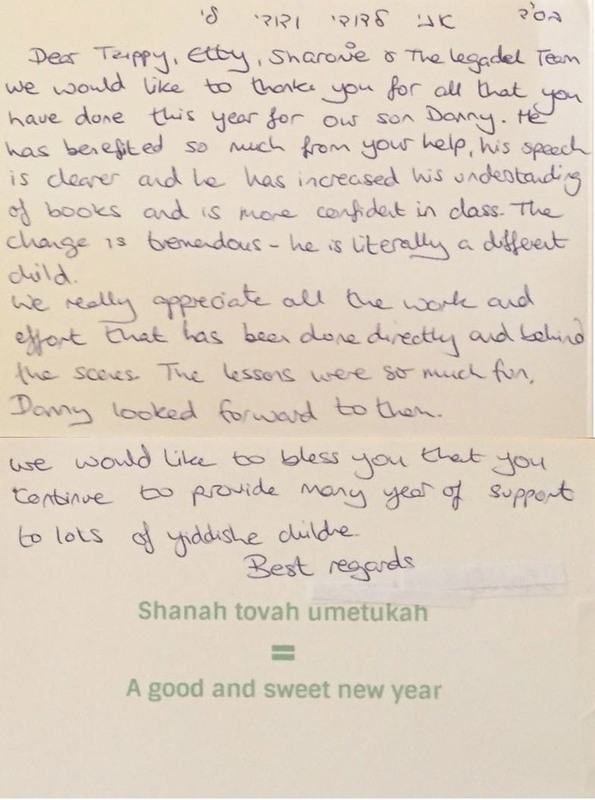 Whilst the school was supportive and nurturing, to be honest we were at a loss as to how we were going to be able to spend more money on providing him the support that it was becoming evident that he desperately needed. 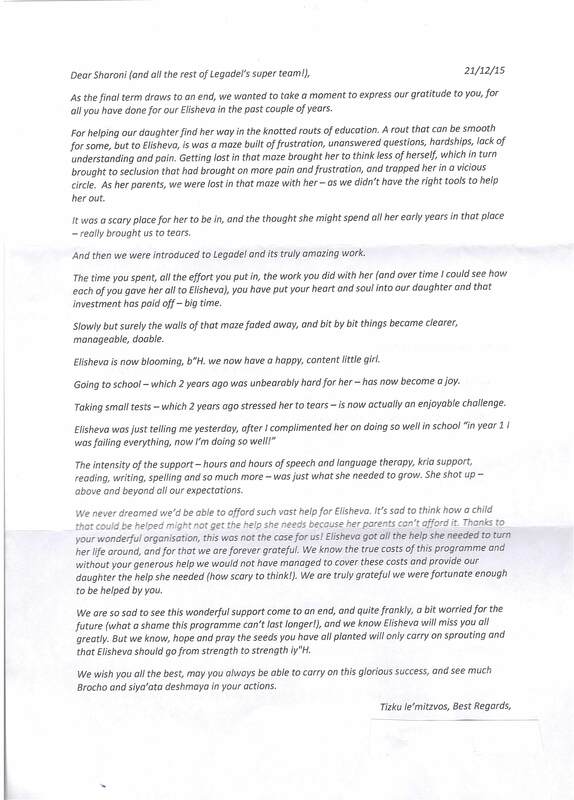 As if a gift from Heaven, it was at this point in time, some two years ago, that our school’s SENCO mentioned to us an organisation, one that was fairly new at the time that she was looking into forming a relationship with. That organisation was Legadel, and we haven’t looked back since. Both of our sons have utilised your services in multiple ways. We have had the privilege of seeing true specialists at work. Myrom Kahaner was truly innovative in his methods, Chavi Braun a consummate professional who helped our older son immensely, to the extent that his teachers noticed a difference within weeks and the incredible Sarah Kramer, whom I cannot praise highly enough both for her dedication to my sons and her absolute brilliance in her field. 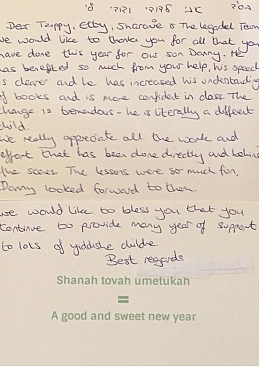 I must also mention Tzipi Halberstam who my son loved working with, Sara Bordon who was able to gain the trust of our son, not an easy task, and Yudit Wechsler who worked tirelessly to help our younger son’s progress. We are still on our journey, particularly with our younger son, who still has a very long way to go, as his needs are complex. 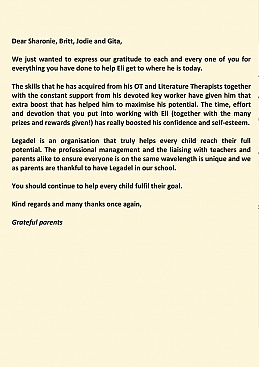 However, without Legadel, we really do not see how we would have not only provided our sons’ the therapies that they so badly needed but also how we would have functioned as a family. B’H we are not poor, we both have jobs and we work hard. However, on many levels we would have fallen through the cracks so to speak without the help of Legadel. Not poor enough to get state help or help from the myriad charities out there that serve the less fortunate of our community. And certainly not wealthy enough to be able to afford what would have amounted to thousands of pounds a month in therapy fees. 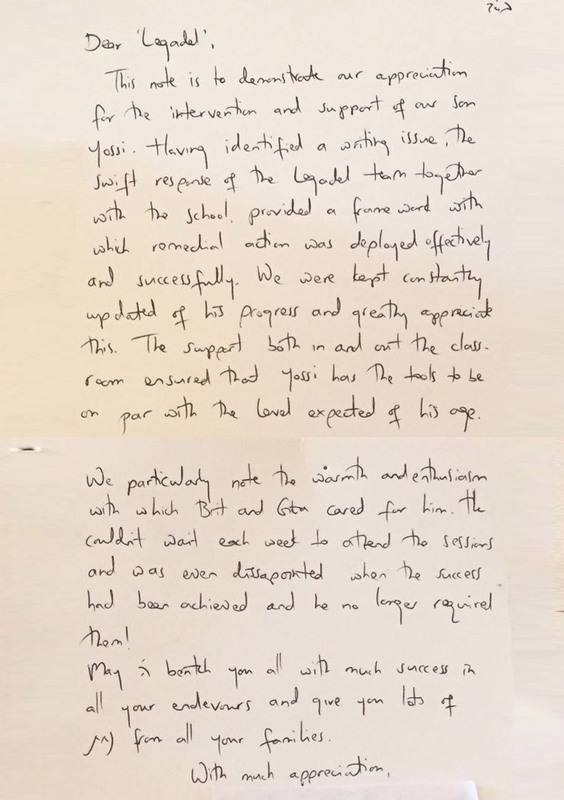 We literally feel that Legadel have saved not only our sons but also our family from what would have been a hopeless situation – deciding which of our sons to help first and knowing that we were doing a deep disservice to them both. 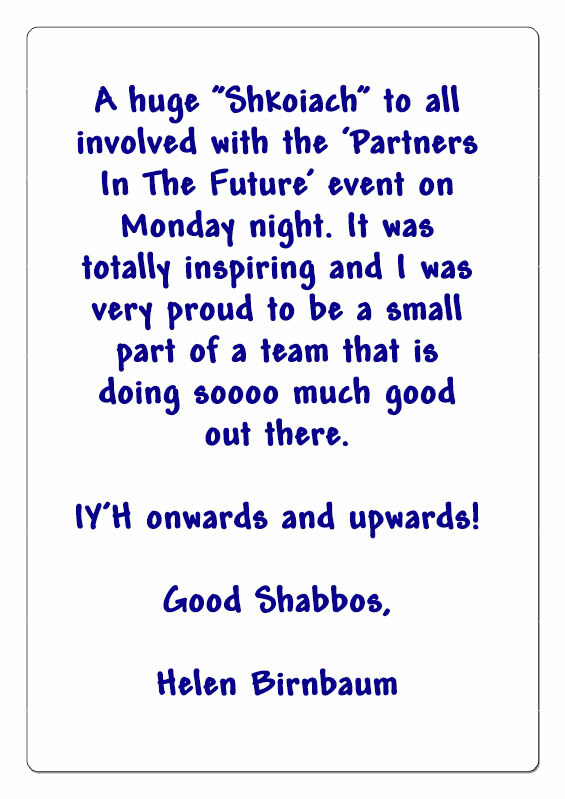 Finally, we would also like to thank Sharonie for her endless background support and for chairing fantastic and constructive parent-school-Legadel meetings as well as your entire Board for the endless work that we know goes into developing and fundraising for an organisation such as this. 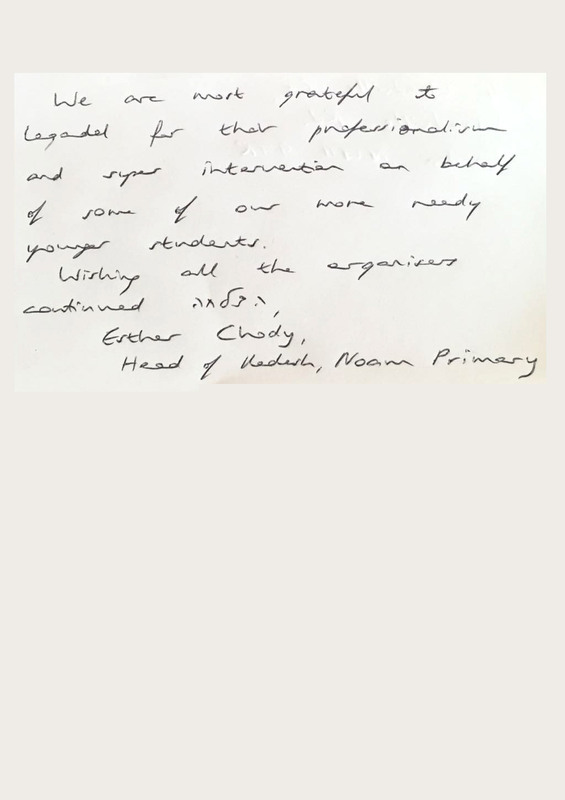 Whilst at times our financial contributions have been challenging for us, we truly see how the partnership between us, our children’s school and Legadel is an important one and in this way we are all invested in the support that we are as a united team giving our precious children. If we had one wish, it would be that Legadel were able to continue working with our children as they progress through Primary School. We do wonder how we will manage in the future but this doesn’t negate out appreciation for the past and present! From the bottom of our hearts, we thank you all for everything that you do to make this phenomenal organisation the success that it is. I can't believe it's been nearly five years. It has been a pleasure and privilege to work with the team - some of the most generous and dedicated people I have ever met. As I witness some of our very first Legadel children entering their last year of primary school, I reflect on how much I have learnt from them, and hope we have made their early years a little easier. We are so truly grateful for such a wonderful organisation. 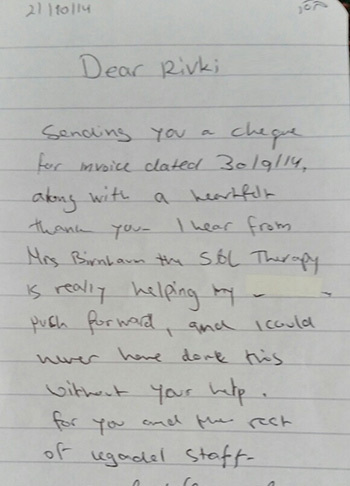 The idea all the way through to the therapy service you provide is brilliant. It has given Motty an opportunity to access and benefit from input in a way that he never could have, had Legadel not existed. You should iyH continue helping as many children as possible and iyH all our kinderlach should have the best chances possible to maximize their potential.